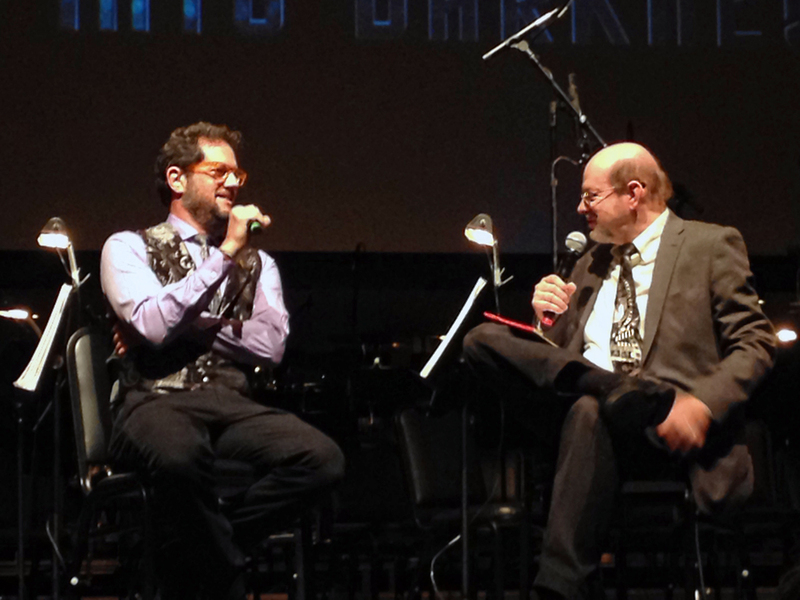 I have hosted American Youth Symphony film-music concerts for seven years now, but rarely has one been so much fun as Sunday’s live-to-picture performance of Michael Giacchino’s score for Star Trek: Into Darkness, conducted by (the, let’s face it, phenomenal) David Newman. The Oscar-winning composer came out at the beginning, for an interview about the challenges of scoring the Trek films (and confirming that he’ll score the next one, Beyond); and again at the end, to conduct the premier performance of his suite from this year’s delightful Pixar film Inside Out. The sellout crowd at UCLA’s Royce Hall loved it. This entry was posted in and tagged American Youth Symphony, David Newman, Inside Out, Michael Giacchino, Star Trek Beyond, Star Trek Into Darkness on September 28, 2015 by Jon Burlingame.